Long Street looks lovely in spring with the Jubilee Library cherry blossom out and the trees coming into leaf. This panorama shows how Middleton’s Jubilee Library was designed to respect the timber-framed Old Boar’s Head. The library is an early and unusual Arts & Crafts design and there is only one other listed Arts & Crafts library in England of such an early date. The official architect was Laurence Booth of Bury who won the competition for designing the library. However, he built nothing like it before or afterwards. 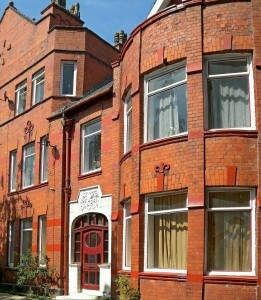 Instead, the building is in Edgar Wood’s early Arts & Crafts style (he was aged 29 in 1889). Edgar Wood’s father and his main client (Schwabe) were the two principal funders of the library and many of the other large funders were also Edgar Wood clients. We think that Laurence Booth was a front to hide Edgar’s involvement as he could not have fairly competed and it would have have been controversial for him to do so. There are many clues in the surviving records that this was the case and that Edgar Wood was indeed the true designer. In this way, Edgar Wood appears to have designed the town’s first public library creating a state of the art design some ten years before Arts & Crafts architecture began to take off. Consequently, the Library is now firmly on the Edgar Wood heritage trail! Edgar Wood’s avant garde buildings were very contentious locally and he had to take a very low profile in the design of publicly funded buildings. Similar methods were used to hide his involvement in the design of Long Street Methodist, the Arts & Crafts Church, when he was only revealed as architect at the last minute in December 1898 after all the decisions had been made. Likewise, he was hidden from view in the restoration of the Parish Church and, as one of the leading town planners of England, we also think he was the hidden designer of Alkrington Garden Village. The official designer, Thomas Adams, would have known Edgar as they were both involved in Letchworth Garden City, Hertfordshire. The Library is full of Arts & Crafts features, like the traditional pegged oak construction used for the timber work (which Mr. Booth complained about!). 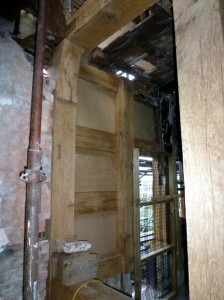 The reinforced concrete construction of the first floor is another Arts & Crafts experimental feature. Blending traditional handicrafts with modern methods like reinforced concrete were very much Edgar Wood’s approach. Later on, he became famous for his flat concrete roofs and for pioneering modern design. 36 Mellalieu Street was Edgar Wood’s first house designed with a concrete flat roof that covered the whole building. It was drawn up in 1906, five years after he had begun experimenting with flat roofs and three years after he had first met J. Henry Sellers and they had begun on their ambitious project to create a new architecture for the new century. 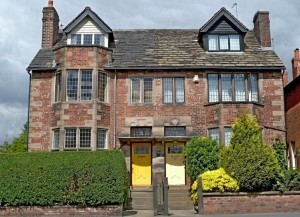 Between 1907 and 1909, Edgar Wood designed similar-looking cubic houses of different sizes and types in Burnley, Heywood, Stafford, Sheffield and Hertfordshire. They were the first modern movement houses in the world and were highly influential. When 36 Mellalieu Street was built in 1910, Edgar decided to leave off one of the two bay windows he originally planned and to give the detailing a vernacular character. Even so, it was the most modern town house in the country and its cubic form set the style for modern buildings for decades. 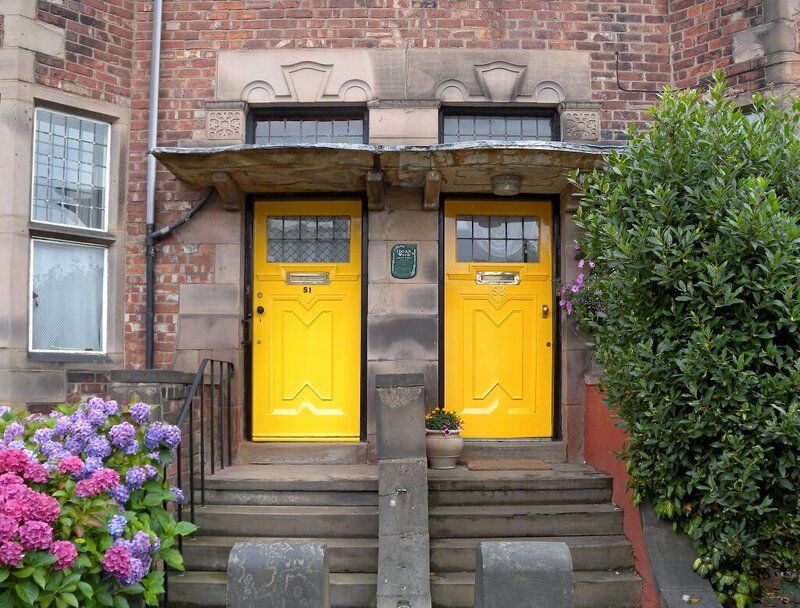 36 Mellalieu Street was restored to its original appearance in 2012 as part of the Edgar Wood and Middleton Heritage Initiative. 36 Mellalieu Street is listed Grade II by English Heritage. Queen Elizabeth Grammar School was built in 1586 to replace the chantry school at St. Leonard’s Church which was abolished in the Reformation. 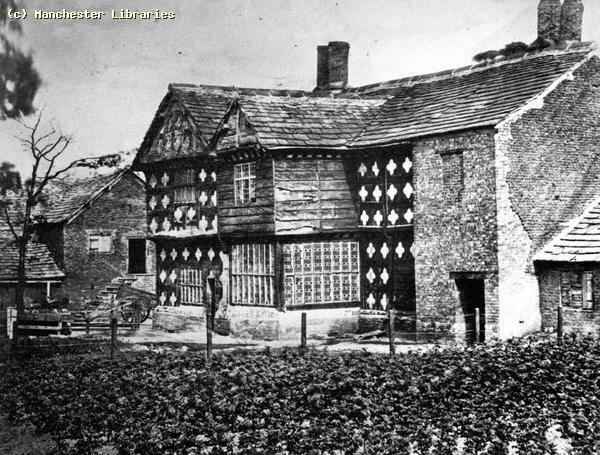 When it was built, there was no town of Middleton but a rural township with scattered buildings that spread across north Manchester as far as Bolton. Though one can find Grammar Schools of an earlier date than Middleton’s, we have yet to find an earlier one still with its original buildings. So we think this is the oldest surviving Grammar School in England. If we are wrong, please let us know! The school had a link-up with Brazenose College, Oxford – students of the school could go onto the college. 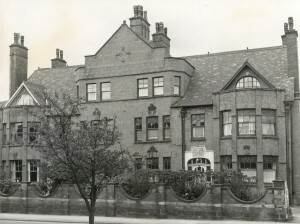 It was still in use in Victorian times and was the school attended by Edgar Wood – his initials in his characteristic script are scrawled on the walls in the building (something actually encouraged at the time). The school now has several uses, including as a delightful venue for private receptions and parties. Edgar Wood and J. Henry Sellers had met up in 1903 and quickly began working on a new type of ‘cubic’ architecture using reinforced concrete and to create buildings not possible with traditional roofs. Elm Street School (now Elm Wood School) was designed as a ‘Board School’. 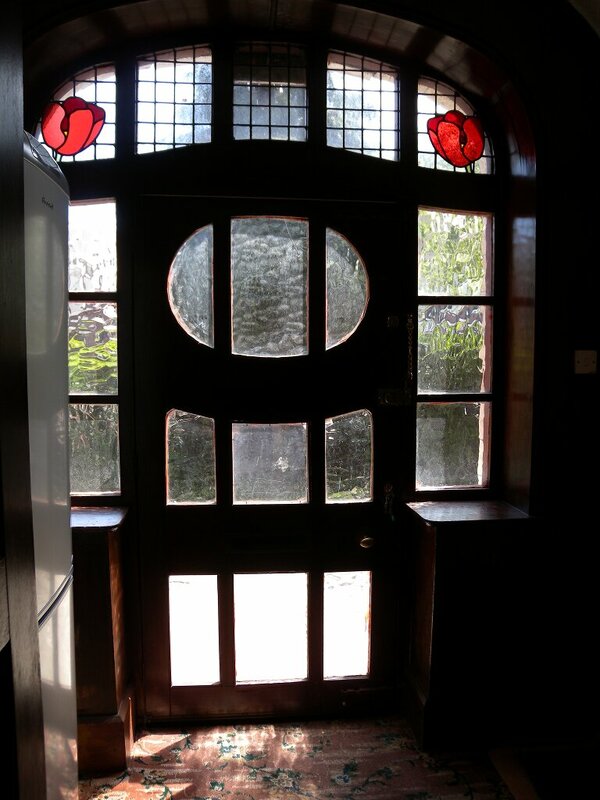 However, it was radically different to the other schools of this type and is celebrated as a high point of Wood’s and Sellers’ Arts & Crafts modernism. 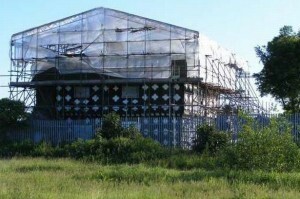 It was one of just a handful of joint designs by the two architects, despite having worked together on the new style. Edgar Wood was extremely busy in 1908 and most likely he asked Sellers to help him with the design which he had recieved after much lobbying of the Middleton Education Committee. Elm Street School is a symmetrical building using a motif of a rectangle and semicircle to shape a substantial garden at its centre. The rectangle and semicircle also shapes the architectural detailing and the constant reuse of these two shapes bestows a quiet unity to the design. The semicircle is expressed as a concave single-storey limestone façade facing the garden and behind rises an impressive brick school hall with nine round-headed windows and short limestone-capped towers at each end. The height of the hall windows, which makes the interior so bright, is only possible because flat concrete roofs are used on the surrounding classrooms. The main hall has a fine plaster ceiling decorated with a large rectangle and two semicircles in blue and yellow/orange, the original colours. Two sides of the garden are enclosed by passageways with semicircular openings, which connect the school entrances to the road and provide shelter for the children. 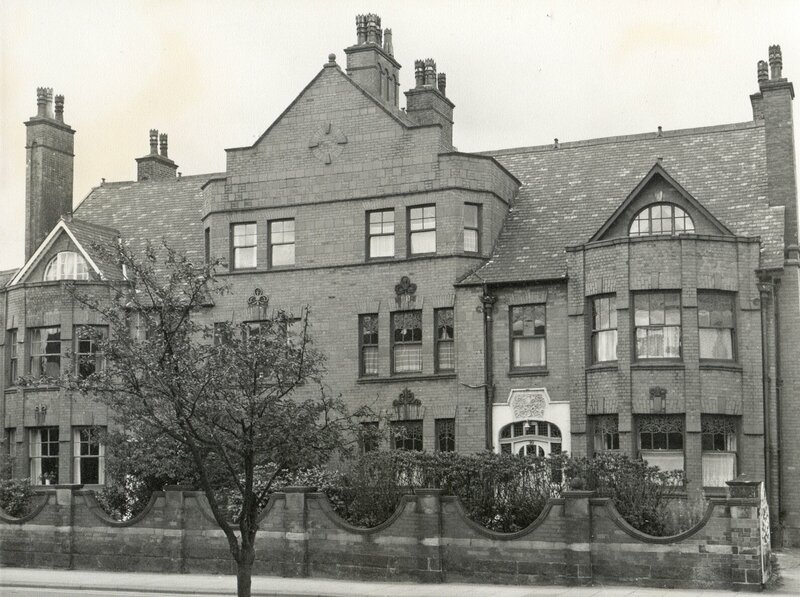 The garden is a safe place for young children to play and, like the garden at Long Street Methodist School, it shows that Edgar Wood wanted children to experience the beauty of nature. Compare Elm Street School with the Long Street Methodist School? They look completely different yet are based on the same idea of a school set around an Arts & Crafts garden. Elm Street School is still used as a school today. It has been renamed Elm Wood School in honour of its designer. 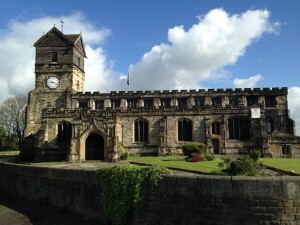 The buildings are owned by Rochdale Council which, with the school, has carried out conservation work in recent years, including restoring the original windows. 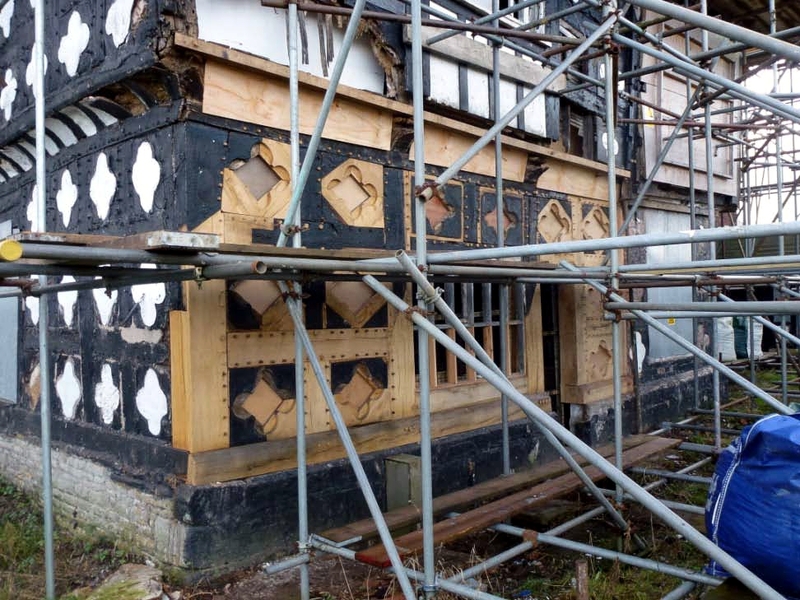 Tonge Hall is generally regarded as one of the finest examples of Tudor architecture in the country and despite a devastating fire in 2007, still retains many of its original features, including carved oak beams, inglenook fireplaces timber panelling and a wonderful spiral staircase. 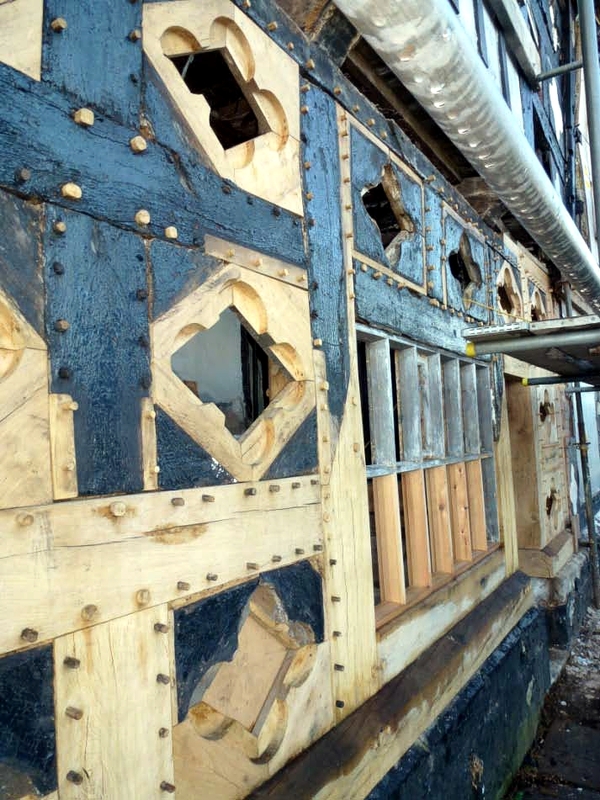 The building was heroically saved by Heritage Trust for the North West whose contracting arm undertook extremely skilful emergency conservation work after the fire – work beyond the ability of the majority of contractors. 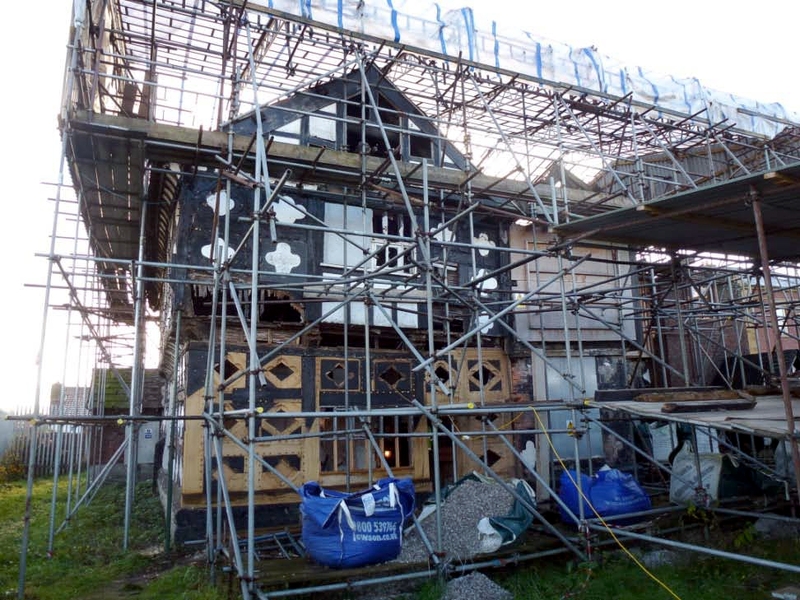 The work was planned and supervised by national conservation expert Alan Gardner who is a great supporter of Middleton’s ‘Golden Cluster’ of buildings. 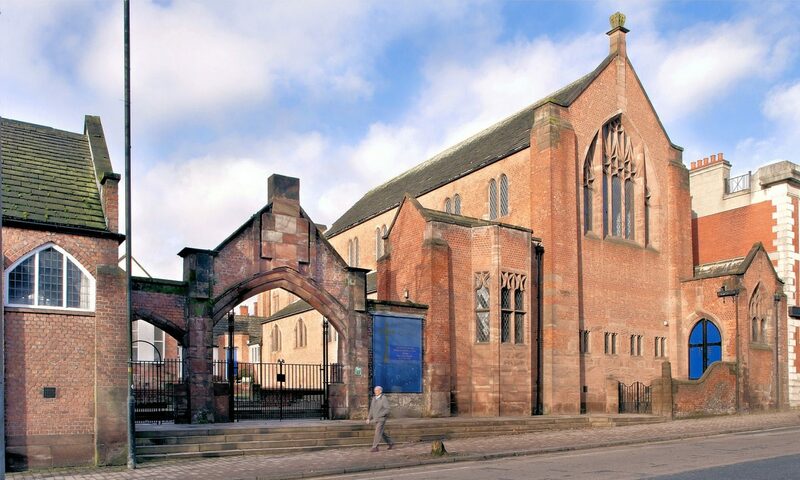 Great credit should also go to English Heritage, which provided the finance and to Rochdale Council which initially secured the site and has now taken over the ownership. 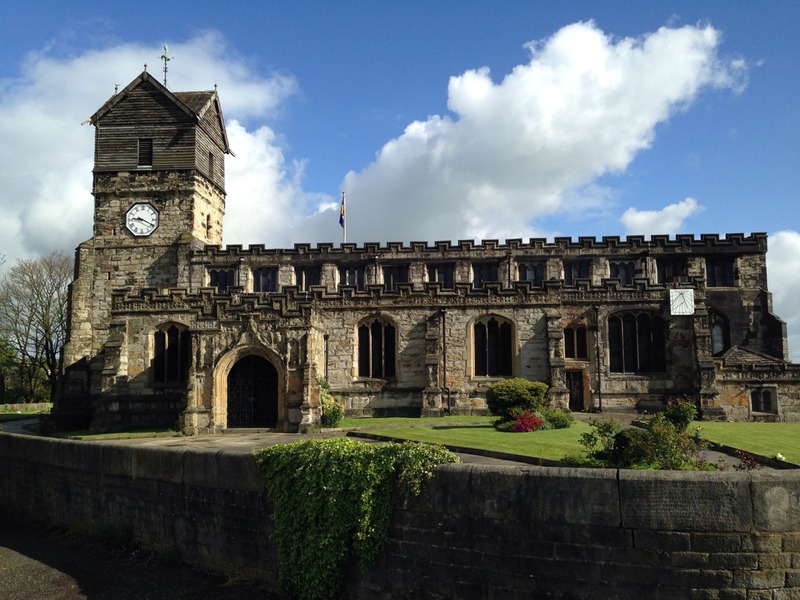 The Society for the Protection of Ancient Buildings has also contributed with money and support as has the local support group, Friends of Middleton View who are pushing for a conservation area. Tonge Hall now sits in a huge scaffold cage supporting and protecting it, while a long term scheme is drawn up by the Council. 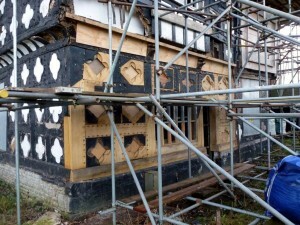 Heritage Trust for the North West are keeping an eye on things in the meantime. When Redcroft (left) and Fencegate (right) were built in 1891, they were the most modern pair of ‘semis’ in the country. They began a new phase of Arts & Crafts design which reworked the humble features of farmhouses and cottages into new sophisticated architecture. Edgar Wood’s buildings had been hinting at this vernacular inspired style for several years. 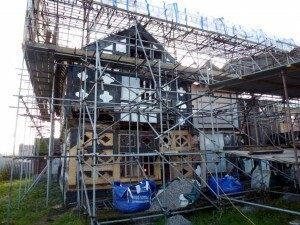 The problem was that few wealthy Victorian businessmen wanted their new home to look like a crumbling old cottage! 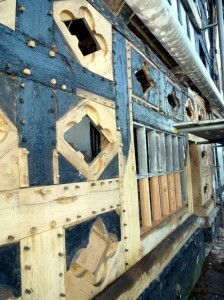 Wood could only introduce a few features here and there so as not to be overruled by his clients. However, with Redcroft and Fencegate, Edgar was both the client and the designer. He was free to design the house as he wished, save for the views of his supportive father who was paying for it as Edgar and Annie Wood’s wedding present – they were married that year. Edgar and Annie lived at Redcroft while the manager of his father’s mill, Mr. Wiggins, lived at Fencegate. When building Redcroft, Edgar looked up at the just plastered ceiling and a large piece of wet plaster fell into his face. Plaster is extremely alkaline and he lost an eye in the accident. Had Edgar lost both eyes, his career would have ended immediately and the appearance of buildings fifty years hence might have looked rather different. 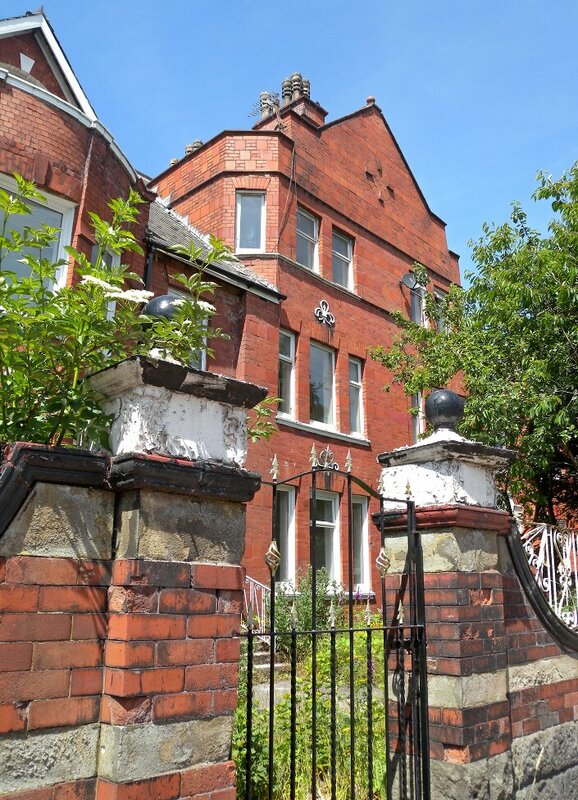 51 & 53 Rochdale Road are well preserved example of Arts and Crafts domestic architecture. A picturesque quality is obtained through sensitive use of materials rather than irregular form. The form is blocky and efficient, with a grid-like arrangement of elements on the main facade. Asymmetry is created simply by raising the bay window on the left hand side, so that it breaks the eaves. Wood’s later designs, for example 36 Mellalieu Street nearby do a similar thing and both are examples of Wood changing his architectural expression from irregular forms to one where materials and formality increasingly play the dominant role. The building is one of the first polite architect-designed house designs to use common bricks to define the front elevation, something which, again, looked towards the future. 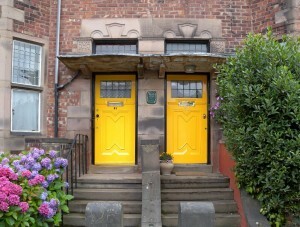 Another interesting feature is the design of the two front doors, which anticipate Art Deco by some 25 years! In the early days of Arts & Crafts architecture, pioneers like Edgar Wood experimented with a variety of materials and forms, trying to find a new way in design. 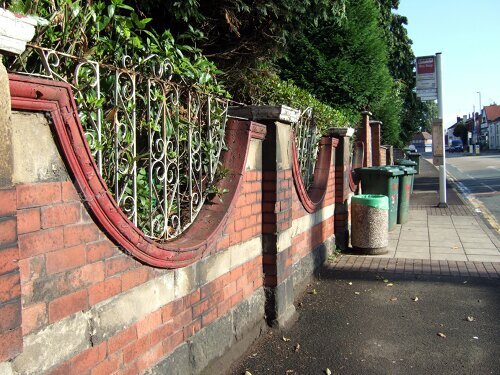 The semi-detached pair of houses on Rochdale Road, Middleton, Briarhill & Hillcrest, is one of these and represents an art nouveau ‘town’ approach to design in contrast to the vernacular revival ‘country’ approach of Redcroft & Fencegate next door. Their appearance could not have been more different, with bright red Ruabon bricks, tall angular symmetry and pioneering Art Nouveau forms. This striking and original building, now considerably at risk in 2016, is one of the world’s first art nouveau buildings and takes no prisoners in its powerful expression. It was so advanced in its day that the design was published across Britain, Europe and USA and it set the trend for other ‘all red’ buildings. Some people struggle to like it, though others adore its bold and uncompromising impact.The use of identically coloured red brick and terracotta was approved of by William Morris, where the smoky atmosphere required such materials. However, when it came to the roof, Edgar Wood did something no other architect had thought of, he mix five different types of slate from around the country, to create a mottled impressionistic surface – an idea transferred from the realm of painting to building. 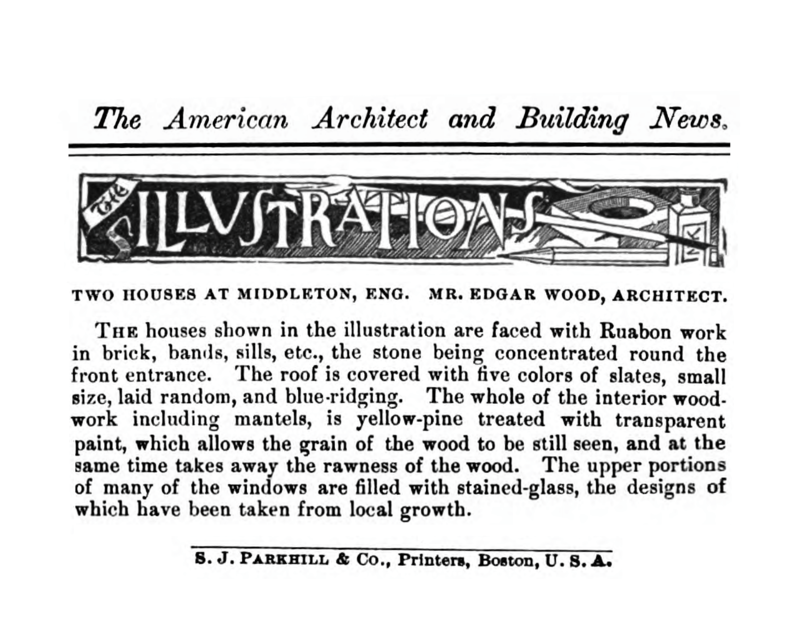 The building was illustrated in the USA publication, American Architect and Building News a year later. This magazine was published in Boston and would have been admired by the early Arts and Crafts designers of the eastern States. Hopwood Hall is one of the truly great buildings of Middleton but one which has sadly been left to rot under the custodianship of Rochdale M.B.C. 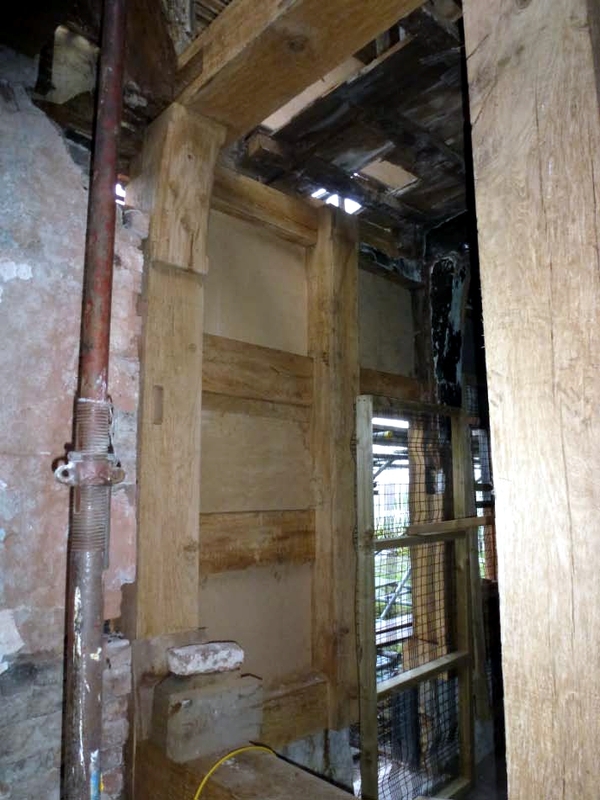 Recently, the Council has tried to make amends by providing security and undertaking urgent repairs. 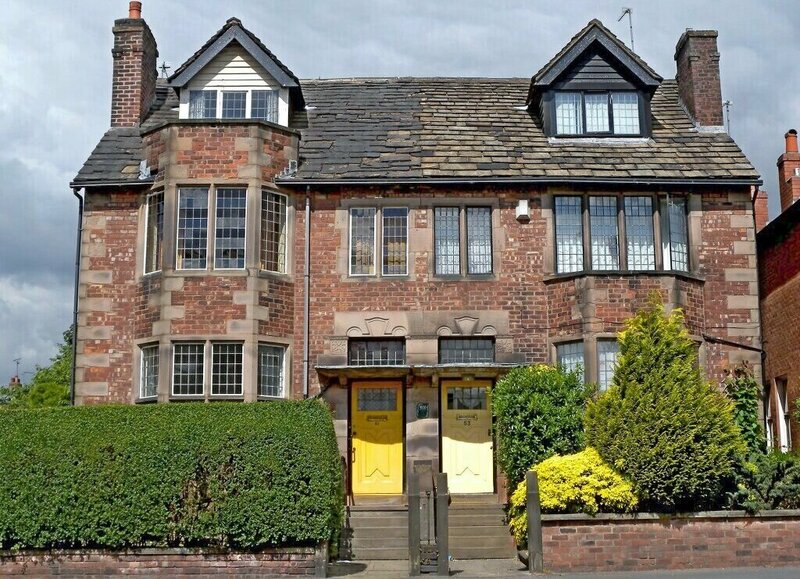 There is some hope, with the leadership of Hopwood Hall College and a host of volunteers, plans are being tentatively drawn up to save the building. 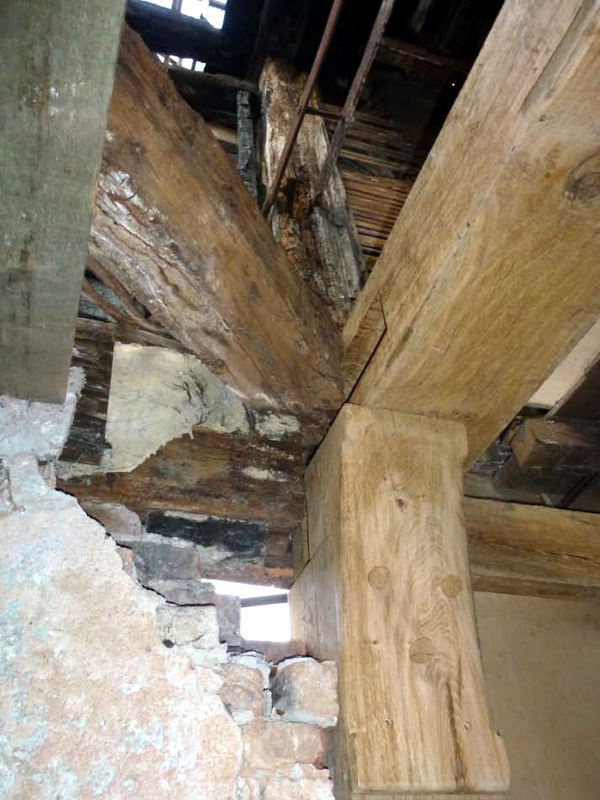 Great credit should go to Mr. Bob Wall for his constant efforts on behalf of the building, to Andy Marshall, for his amazing photos and to conservation expert Alan Gardner whose advice and direction have been critical to saving the building. 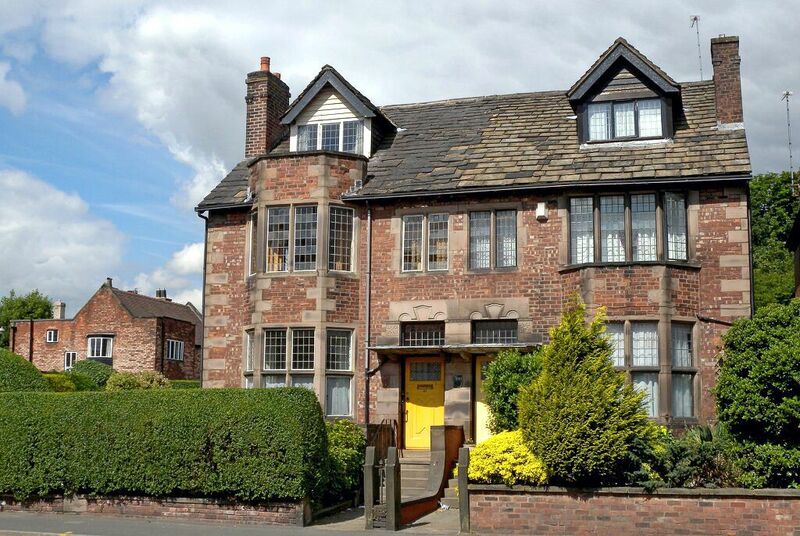 Hopwood Hall is remembered by students of the old De La Salle art college of the 1980s – the chapel to the college is also a listed building but of a very different type, a modernist creation of the 1960s – famous for being Liverpool R.C. Cathedral in miniature. Hopwood Hall is a building of many ages where the work of the medieval carpenter sits next to that of the modern builder. Its history is long and complex and the buildings ‘ramble’ like no other. 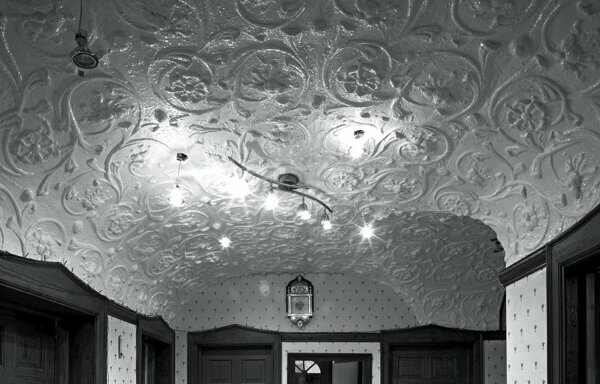 Edgar Wood was a fan and around 1910 carried out a sensitive restoration which, in turn, complemented the characterful work by the architect Geoge Shaw of Saddleworth half a century earlier. The interiors are rich in Jacobean panelling and plaster work but currently the floors are simply too rotten and dangerous to walk on. However, you can get a good view from Andy Marshall’s photos.